Background Vitamin D has been suggested to influence the incidence and prognosis of breast cancer, and studies have found better overall survival (OS) after diagnosis for breast cancer in summer–autumn, where the vitamin D level are expected to be highest. Objective To compare the prognostic outcome for early breast cancer patients operated at different seasons of the year. Design Open population-based cohort study. Setting Danish women operated 1978–2010. Cases 79 658 adjusted for age at surgery, period of surgery, tumour size, axillary lymph node status and hormone receptor status. Statistical analysis The association between OS and season of surgery was analysed by Cox proportional hazards regression models, at survival periods 0–1, 0–2, 0–5 and 0–10 years after surgery. A two-sided p value <0.05 was considered statistical significant. Results Only after adjustment for prognostic factors that may be influenced by vitamin D, 1-year survival was close to significantly associated season of surgery. 2, 5 and 10 years after surgery, the association between OS and season of surgery was not significant. Limitations Season is a surrogate measure of vitamin D.
Conclusions The authors found no evidence of a seasonal variation in the survival after surgery for early breast cancer. Lack of seasonal variation in this study does not necessarily mean that vitamin D is of no importance for the outcome for breast cancer patients. Breast cancer survival and season of surgery. No evidence of a seasonal variation. The sample size (approximately 80 000 cases). The population-based approach in a limited geographic area. The prospectively collected characteristics of tumour and lymph node status. The long follow-up (median 10.0 years). The lack of information about vitamin D status in the individual patient at the time of surgery. It is not known whether vitamin D levels of the breast cancer patients follow that of the background population. If the vitamin D status at the time of the operation is important for the overall survival (OS), it should be both easy and inexpensive to adjust preoperatively. The aim of this study is to compare the prognostic outcome for early breast cancer patients diagnosed and operated at different seasons of the year based on a large population-based registration of women with breast cancer in Denmark including detailed information on prognostic factors. From 1 June 1978 to 31 May 2010, 89 409 cases were registered. Of these, 3113 had a diagnosis of previous breast cancer, other malignancy (except non-melanoma skin tumours) or distant metastasis and 610 patients were not operated. Further excluded from the analyses were patients with unknown tumour size (n=2045) and/or unknown axillary lymph node status (n=5678). In total, 79 658 cases were included for further analyses (figure 1). 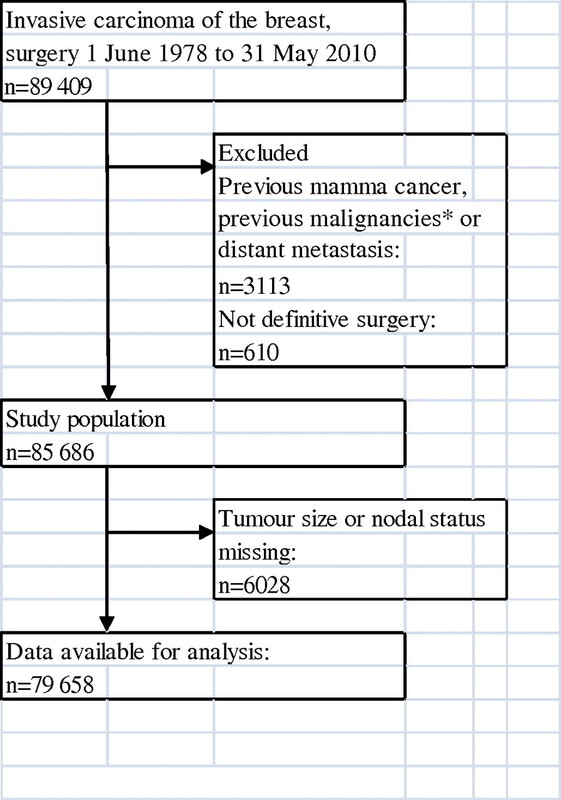 Flow diagram: prospective registration of Danish women operated for early breast cancer 1978–2010. *Except non-melanoma skin tumours. The seasons of surgery, generally 1–3 weeks after the diagnosis, were defined as follows: winter (1 December to 28 or 29 February), spring (1 March to 31 May), summer (1 June to 31 August) and autumn (1 September to 30 November), so the summer period includes the months with the possibility of most sun exposure due to the altitude of the sun and vacations. Treatment periods were categorised according to the national programmes initiated in 1977, 1982, 1989, 1999, 2001, 2004 and 2007.25 The age at surgery was categorised in intervals: ≤39, 40–49, 50–59, 60–69, 70–79 and ≥80 years. Tumour size was categorised according to the largest tumour diameter: 0–10, 11–20, 21–50 and ≥51 mm. The spread of breast cancer to locoregional lymph nodes was categorised as negative, one to three positive lymph nodes and four or more positive lymph nodes. The hormone receptor status was categorised as: negative, oestrogen receptor or progesterone receptor positive and unknown. The histopathological status was categorised in five groups as: grade I, II or III ductal carcinoma, lobular carcinoma and carcinoma of other types or unknown diagnosis. The frequency of allocated systemic treatment (chemotherapy and endocrine therapy) by season of surgery was reported. OS was measured from the date of surgery to the date of death. Observations were censored at emigration or at 1 June 2011, which was the date of data withdrawal of patient vital status from the Danish Centralised Civil Register. The association between OS and season of surgery was analysed by Cox proportional hazards regression models.27 28 The effects of season of surgery were analysed in models with an increasing level of adjustment for prognostic variables: models stratified by treatment programme (adjusted I); models stratified by treatment programme and age at surgery (adjusted II) and models stratified by treatment programme, age at surgery, hormone receptor status and lymph node status and further including the effects of tumour size and histological type (fully adjusted). The interpretations of a seasonal effect on survival in these models differ according to the level of adjustment. In the fully adjusted model, the seasonal effect includes the effects of unknown or not included prognostic variables including the alleged effect of vitamin D. In the adjusted II model, the seasonal effect includes the effects of both known and unknown prognostic variables. In the adjusted I model, the seasonal effect further includes the effects of referral pattern, that is, patient age at surgery. The stratification of the Cox models was chosen to meet the proportional hazards assumption as assessed by Schoenfeld residuals plots.27 The analyses were done for four survival periods: 0–1, 0–2, 0–5 and 0–10 years after surgery. The null hypothesis of no survival effect of season of surgery was assessed by the Wald χ2 statistic, and a two-sided p value <0.05 was considered statistically significant. The HRs of season of surgery (winter as reference level) together with their 95% CIs are reported. Due to the long period of inclusion, the potential heterogeneity of seasonal effects according to period of inclusion was investigated in models including an interaction term of season of surgery and programme series (1977 and 1982 vs 1989 vs 1999, 2001, 2004 and 2007). Analysis was performed with SAS V.9.1 (SAS Institute). The person-years of observation were 78 587 for the survival period 0–1 years, 151 980 for the survival period 0–2 years, 327 646 for the survival period 0–5 years and 516 011 for the survival period 0–10 years after surgery. For the latter group, the median observation period for patients without an event was 10.0 year. The basic characteristics of the patient material according to season of surgery are presented in table 1. HRs of OS up to 10 years with surgery performed in winter as reference are given in table 2. Overall, no statistically significant association between OS and season of surgery are observed in 2-, 5- and 10-year follow-up periods. Only for the 1-year follow-up, a close to significant association is observed (p=0.052, fully adjusted analysis); OS is highest for patients undergoing surgery in autumn (HR: 0.97, 95% CI 0.86 to 1.09) and lowest for patients undergoing surgery in summer (HR: 1.12, 95% CI 1.00 to 1.26). Heterogeneity of seasonal effects according to period of inclusion was not statistical significant irrespective of model adjustment or survival period. Results from UK and Norway indicate a better prognosis if diagnosis of breast cancer takes place during the summer or autumn.20–22 This seasonal variation was interpreted as a result of vitamin D deficiency in the dark months of the year, although one author considered the possibility that the seasonal effect might be due to a relative higher rate of diagnoses in summer and the prevalence of infections during wintertime leading to early death.20 In contrast, results from Sweden demonstrate a worse OS for patients diagnosed in the summer probably due to a relative reduction in the number of early stage diagnoses from mammography screening which are closed in the summer months and the healthcare system treating primarily the most sick patients in holiday periods.23 30 Breast cancer is regarded as a relatively slow growing cancer, with a long preclinical course.31 If vitamin D level should be of etiologic or prognostic importance, it is supposed that the influence is working over a longer time period and not just reflected by vitamin D status at time of diagnosis. If the level of vitamin D at the time of surgery should influence prognosis, the mechanism must be differences in perioperative resistance to cancer dissemination and the logical precaution would be to ensure a high preoperative vitamin D level. However, limited evidence including the present study supports this statement.
. Does sunlight have a beneficial influence on certain cancers? Prog Biophys Mol Biol 2006;92:132–9.
. Does sunlight prevent cancer? A systematic review. Eur J Cancer 2006;42:2222–32.
. The vitamin D receptor in cancer. Proc Nutr Soc 2008;67:115–27.
. Vitamin D and prevention of breast cancer. Acta Pharmacol Sin 2007;28:1373–82.
. Serum 25-hydroxyvitamin D and risk of post-menopausal breast cancer–results of a large case-control study. Carcinogenesis 2008;29:93–9.
. Vitamin D and breast cancer. Ann Epidemiol 2009;19:462–7.
. Meta-analysis of vitamin D, calcium and the prevention of breast cancer. Breast Cancer Res Treat 2010;121:469–77.
. Association between plasma 25-hydroxyvitamin D and breast cancer risk. Cancer Prev Res (Phila Pa) 2009;2:598–604.
. The role of vitamin D in cancer prevention. Am J Public Health 2006;96:252–61.
. Prognostic effects of 25-hydroxyvitamin D levels in early breast cancer. J Clin Oncol 2009;27:3757–63.
. Vitamin D deficiency is correlated with poor outcomes in patients with luminal-type breast cancer. Ann Surg Oncol 2011;18:1830–6.
. Serum 25-hydroxyvitamin D levels in early and advanced breast cancer. J Clin Pathol 2006;59:1334–6.
. Review article: vitamin D acquisition and breast cancer risk. Reprod Sci 2009;16:7–19.
. Reduced prediagnostic 25-hydroxyvitamin D levels in women with breast cancer: a nested case-control study. Cancer Epidemiol Biomarkers Prev 2009;18:2655–60.
. Serum 25-hydroxyvitamin D and postmenopausal breast cancer survival: a prospective patient cohort study. Breast Cancer Res 2011;13:R74.
. Calcium plus vitamin D supplementation and the risk of breast cancer. J Natl Cancer Inst 2008;100:1581–91.
. Serum levels of vitamin D metabolites and breast cancer risk in the prostate, lung, colorectal, and ovarian cancer screening trial. Cancer Epidemiol Biomarkers Prev 2008;17:889–94.
. Meta-analysis of observational studies of serum 25-hydroxyvitamin D levels and colorectal, breast and prostate cancer and colorectal adenoma. Int J Cancer 2011;128:1414–24.
. Meta-analysis: serum vitamin D and breast cancer risk. Eur J Cancer 2010;46:2196–205.
. Cancer survival is dependent on season of diagnosis and sunlight exposure. Int J Cancer 2006;119:1530–6.
. Changes in risk of death from breast cancer with season and latitude: sun exposure and breast cancer survival in Norway. Breast Cancer Res Treat 2007;102:323–8.
. Vitamin D3 from sunlight may improve the prognosis of breast-, colon- and prostate cancer (Norway). Cancer Causes Control 2004;15:149–58.
. Season of diagnosis and prognosis in breast and prostate cancer. Cancer Causes Control 2009;20:663–70.
. [Vitamin D deficiency. Definition and prevalence in Denmark]. Ugeskr Laeger 2005;167:29–33.
. The clinical database and the treatment guidelines of the Danish Breast Cancer Cooperative Group (DBCG); its 30-years experience and future promise. Acta Oncol 2008;47:506–24.
. Population-based study of peritumoral lymphovascular invasion and outcome among patients with operable breast cancer. J Natl Cancer Inst 2009;101:729–35.
. Partial residuals for the proportional hazards regression model. Biometrika 2011;69:239–41.
. The Statistical Analysis of Failure Time Data. John Wiley.
. Geographic location and vitamin D synthesis. Mol Aspects Med 2008;29:453–61.
. Seasonal variation in the diagnosis of cancer: a study based on national cancer registration in Sweden. Br J Cancer 2003;88:1358–60.
. Natural history of breast cancer. Progression from hyperplasia to neoplasia as predicted by angiogenesis. Cancer 1977;39(6 Suppl):2697–703. We will be pleased to share the necessary data for the statistical review of our paper. However, it is not possible for us to make the entire data material public available. Competing interests All authors have completed the ICMJE disclosure form (available on request from the corresponding author) and declare: no support from any organisation for the submitted work, no financial relationships with any organisations that might have an interest in the submitted work in the previous 3 years and no other relationships or activities that could appear to have influenced the submitted work. Ethics approval The data are from Danish Breast Cancer Group. Contributors DT contributed to conception and interpretation of data, reviewed the literature, drafted the article and finally approved the submitted paper. KDB analysed and interpreted the data, drafted the statistical part and finally approved the submitted paper. AMT and NK contributed to the interpretation of data, revised it critically for important intellectual contents and finally approved the submitted paper.